 Thai Pusam is a festival in which people enjoy themselves to the hilt in rich pageantry. Palani is one of the most exciting pilgrim cities of India, in the immediate post-harvest season of the ten-day Thai Pusam festival in the Periyanāyaki Temple. 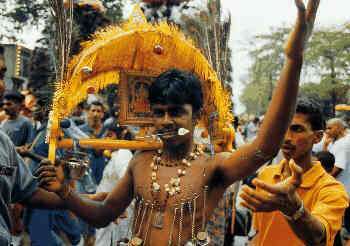 As in other festivals, a different vāhanam is used for each day's procession. On the seventh day, the full-moon day marking the Thai Pusam, the deity is taken to the banks of the Shanmuga Nadi for a bath and the temple car drawn by thousands of devotees. There is a gaily decorated float festival on the tenth day. The unique character of the Thai Pusam is the astonishing parade of people bearing kavadis. As already stated, the kavadi, associated with Idumban, vassal of Muruga, originated in Palani. There are several kinds of kavadis, the milk and rosewater kavadis being the principal ones. The central shaft of the semicircular wooden structure is placed on the shoulders and the pilgrims dressed in yellow costume and decorated with garlands, undergoing many privations to fulfill vows, dance their way through the streets and up the hillock under the hypnotic music provided by the drum, the pipes and the tom-tom. It is a tandava as opposed to the lasya form of dance and when performed with vigour and quick movements produces in the spectators a feeling of exultation and a temptation to keep step with the rhythm and dance. Extreme devotion prompts some kavadi dancers to disfigure their lips. The lower lip is pierced through for the insertion of a copper or brass ring, often with a view to maintain strict silence. The dancers subject themselves to rigorous austerities and try to get rid of their ego, anger, lust and other vices. They dance to the tunes of kavadi-c-cindu, sung by admiring groups of devotees who follow them (the dancers). The divine songs are rendered in charming music by a trained singer and repeated by others in chorus and the emotion-choked dancer goes into raptures hearing them. Sometimes they react by shifting the kavadi over their shoulder, head, nose, etc., in seesaw position, displaying great artistry with many a pose and movement in rhythm, unaided by hand. The number of kavadis reaching Palani for Thai Pusam is about ten thousand. For Pankuni Uttiram, fifty thousand kavadis arrive. It is kavadi to your right, kavadi to your left, kavadi in front of you, kavadi behind you, kavadi above you and kavadi below you. The kavadis are borne by common folk as well as by millionaires who are otherwise confined to their air-conditioned suites. They all come walking (without footwear) in groups from their homes at a distance of about a hundred miles while scores and scores of empty limousines follow them. Crowds line the entire route, cheer the kavadi bearers and offer them tender coconut drinks in praise of their display of courage and determination.